This refreshing, easy-going walk along San Francisco's spectacular waterfront starts at the historic Hyde Street Pier (a collection of historic sailing vessels), visits the San Francisco Maritime National Historic Park visitor center, then heads out along the waterfront following the sandy, crescent-shaped shore of Aquatic Park to the Marina Green, the beautiful and historic Palace of Fine Arts, and Crissy Field. 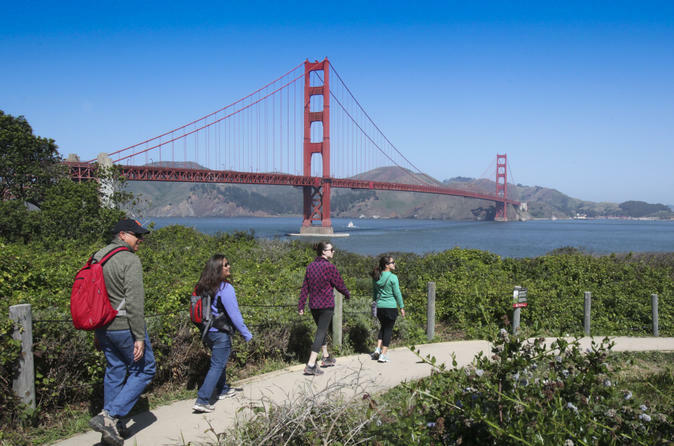 On Thursdays, Fridays and Mondays, we also visit colorful Fort Point, a Civil War-era fort that sits at the base of the Golden Gate Bridge's south tower, before making a short ascent on a scenic coastal trail to the Golden Gate Bridge Overlook. Here you will enjoy photographing the panoramic views of the Golden Gate Bridge, the Bay and Pacific Ocean, Alcatraz and the high bluffs of the Marin Headlands. The guided walk ends here but you are welcome to walk the bridge (1.7 miles each way) on your own, a spectacular bay crossing that should be on every visitors' must-do list. Experience the natural side of San Francisco, where the city meets the sea, on our easy-going walk along the San Francisco's northern waterfront. We walk on easy coastal trails and footpaths that offer a true escape from the bustling city streets, to refreshing panoramic bay views. Our guides offer a glimpse into the rich history of the Bay and Golden Gate, a story that goes back thousands of years to the settlements of Coastal Miwok and Oholone Indians, the 16th century European exploration of the California Coast, the establishment of forts and missions in the Spanish era, and the Mexican and US eras, including the Civil War and World Wars I and II. Our three to four-hour Fisherman's Wharf to Golden Gate Bridge walk begins with a short visit to the historic boats and vessels of the Hyde Street Pier before heading west along the shoreline bordering the yacht-filled Marina Green and the elegant lakeside grounds of the Palace of Fine Arts, a remnant of San Francisco's 1915 Panama-Pacific International Exposition. Continuing on to Crissy Field (a one-time military airfield) and its spectacular vistas of San Francisco Bay, we visit Fort Point, a Civil War-era military fort located dramatically just under the Golden Gate Bridge. We then climb up on a coastal trail to the Golden Gate Bridge Overlook for a unique view of one of the world's greatest landmarks. The formal tour ends here (public transportation available) but you have the opportunity for an on-your-own walk on the Golden Gate Bridge (2 miles round-trip). Transportation to starting/ending point are not provided. Bring your own lunch and/or snacks.